UConn And Cal Punch First Two Tickets To Women's Final Four : The Two-Way The Connecticut Huskies are going to a record sixth-straight Final Four. California is in the Final Four for the first time. Tuesday night, the other two slots will be filled. 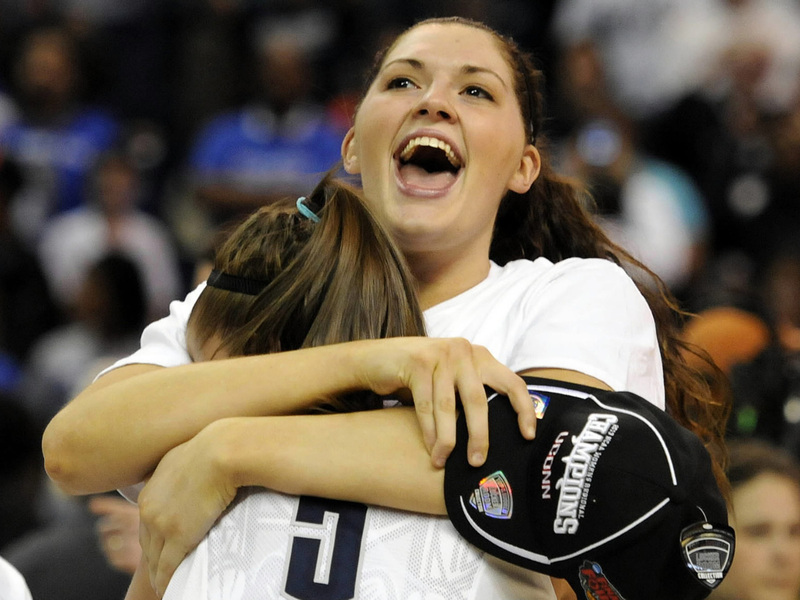 Connecticut center Stefanie Dolson hugs teammate Caroline Doty (No. 5) after the Huskies' win Monday night over Kentucky at Webster Bank Arena in Bridgeport, Conn. The Connecticut women cruised into the Division I basketball championship's Final Four Monday night with an 83-53 win over Kentucky. In the evening's other matchup, California squeaked by Georgia, 65-62. Connecticut, as The Hartford Courant writes, is going to a "record sixth straight Final Four." Freshman Breanna Stewart led the Huskies with 21 points Monday night. Cal, which is in the Final Four for the first time, won despite being 10 points behind with less than seven minutes to play. The Bears came back to tie the game at the end of regulation, and then pull ahead in overtime for the win. "Georgia (28-7), which upset Stanford on Saturday, scored only one basket in the final 7:45 of regulation," The San Francisco Chronicle notes. With No. 1-ranked Baylor's loss over the weekend, Notre Dame (No. 2 going into the tournament) is now the highest-ranked team left in the field. Connecticut was ranked No. 3 at the end of the regular season. Duke was No. 5. California stood at No. 6. Tennessee was No. 10. Louisville is the lowest-ranked team still playing. It came into the tournament at No. 16 in the nation. Baylor won the championship in 2012. Connecticut has won the tournament seven times, most recently in 2010. Tennessee has won a record eight times. We've been covering the men's championship as well.